We are here to help you succeed. Check out the information below to stay on top of important degree milestones, find answers to frequently asked questions, and navigate the policies and procedures at the College of Natural Resources and Center for Geospatial Analytics. The GGSO is a university-recognized community that supports all graduate students affiliated with the center, both on-campus and online (M.S., Ph.D., MGIST, and Graduate Certificate in GIS). Led by students for students, the GGSO advances networking in the geospatial community, provides a platform for research, and offers social events. General start times for enrollment (registration) are included for each semester in NC State’s academic calendar. Subscribe to the Graduate School’s academic calendar for additional details and deadlines. Students should always check Enrollment Dates in MyPack Portal for specific times and dates. The Graduate Handbook provides an overview of Graduate School functions and resources, as well as the rules, regulations, and procedures administered by the Graduate School. It is the responsibility of ALL graduate students to know and understand their degree requirements. Students are responsible for the fulfillment of those requirements. We recommend subscribing to the Graduate School’s academic calendar to help keep track of important dates and deadlines. 2) the Director of Graduate Program (DGP). The approved POW is submitted electronically by the DGP to the Graduate School. For assistance with this process, please review the Plan of Work Powerpoint. Professional master’s students and Graduate Certificate in GIS students can also visit their program websites for more information or consult the program handbook provided during orientation. Students must apply to graduate through MyPack Portal in order to participate in the graduation exercises, have their transcript posted, and receive a diploma. The Graduate School posts deadlines for each semester. However, students should pay attention to program deadlines for applying to graduate, as these will often be earlier than the Graduate School deadline. To learn how to “Apply to Graduate,” see the Graduate School’s informational guide. Additional information for students about external funding and career planning is available on our internal resources site. For specific program questions about the professional master’s degree in Geospatial Information Science and Technology (MGIST) or the Graduate Certificate in GIS, please visit the GIST Online FAQ page. For specific program questions about the Ph.D. in Geospatial Analytics, please visit the Ph.D. program page. How do I apply to one of the degree programs? Visit the How to Apply page for links to application procedures for each of our degree programs. It depends on the degree program. Recent GRE scores (within the past five years) are required for the Ph.D. program in Geospatial Analytics. However, GRE scores are not required for the MGIST and GIS Certificate programs, although you may submit them along with the other application materials. For the MGIST, up to 12 credit hours can be transferred into the program from another institution. However, these credits must be approved by your advisor and/or the program director and follow all Graduate School requirements for transfer credits. For the Graduate Certificate in GIS, transfer credits from another institution are not accepted. Up to 6 credit hours can be transferred into the certificate from courses taken as a non-degree student or undergraduate student at NC State. Certain restrictions apply. Is there a cost difference between an online program and on-campus program? Yes: on-campus tuition and fees vs. Online Education tuition and fees. There are also cost differences associated with residency status (in-state vs. out-of-state). Contact the Cashier’s Office for details regarding tuition and fees. How do I calculate the cost of tuition? Visit the Cashier’s Office website. Tuition is based on the number of credit hours taken in a given semester, as well as your student status (in-state vs. out-of-state, online vs. on-campus). There are a total of 33 required credit hours for the MGIST program and 12 for the Graduate Certificate in GIS. How do I identify my advisor? Advisors are listed in MyPack Portal under the advisor section in your student center. MGIST students will typically receive an email when they begin the program identifying their advisor; orientation also provides an opportunity to meet with advisors. Students in the Ph.D. programs will identify their advisor prior to applying and enrolling in the program. GIS Certificate students are not assigned a specific advisor. Students register for courses via MyPack Portal. Students should consult with their advisor and the enrollment guide for more information. 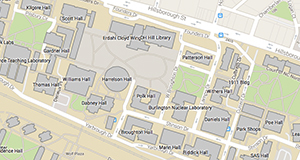 What GIS resources are available to me as an NC State student? Core GIS topics such as map projections and coordinate systems, cartographic design, raster data, etc. VCL stands for Virtual Computing Lab. The NC State VCL provides a remote access service that allows you to reserve a computer with a desired set of applications for yourself, and remotely access it over the Internet. This gives you free access to useful applications such as ArcGIS, PythonWin, Matlab, Photoshop, Dreamweaver, and many others. Watch this VCL demonstration video to see how it works. Blackboard Collaborate provides remote desktop sharing with chat and voice interaction for participants with microphones. For example, you can be at home talking remotely to your teaching assistant at NC State and show her exactly what’s happening on your computer or vice versa. Instructors using this tool will provide a link to their session or the name of their session, which you can search when you log in to Blackboard Collaborate. When you go to participate in a session, you will be prompted to allow your browser to run the Java Web Start Launcher. Watch this video to see how it works. Wolfware is an NC State web-based course management system used for some courses to deliver online course content. Students can access their courses’ online content and tools, including discussion forums, video lectures, gradebooks, and other interactive features. Check out the Wolfware site for current course listings and additional student resources. Moodle is an open source course management system used for some courses at NC State to deliver online course materials. Instructors can use Moodle to create chats, discussion forums, wikis, and announcements. For more information, watch the orientation videos. The free version of Jing allows you to capture an image or an (up to) 5-minute video from your computer. You can then save to disk, copy to clipboard, or (best of all!) post on the web, with a link to your image/video at Screencast.com––a great communication tool for getting help from your classmates, instructor, or teaching assistant when you are trying to troubleshoot an application or procedure on your own. We recommend downloading and installing the free version of Jing, and watching the overview video to see how it can be useful. How can I access Geospatial Data Services? There are many great resources to be found within the Geospatial Data Services webpage through NC State’s Natural Resources Library. You can also find information on GIS resources and more at Reddit GIS. Email listserv: all students are automatically added to an email listserv for general announcements; this includes job and internship announcements that we receive directly from employers. Career Dashboard: our GIST Online programs have a dedicated hub for job search information with links to professional organizations, GIS specific job sites, and more. LinkedIN: current students and alumni of the NC State GIS programs are invited to join our LinkedIN Networking Group. 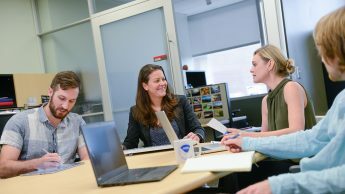 Students can also use the services of NC State’s Career Development Center. All students also have access to ePack, the online repository of jobs and internships for NC State students.